What do you do when you have an excess amount of overly ripe bananas? Make banana bread, right? Wrong–kind of in this case. I didn’t want to make the same old banana walnut bread/ muffins although those are tasty I wanted a twist. So I searched the internet and stumbled across a cream cheese banana bread recipe–yum! I love cream cheese. You could slather cream cheese on just about anything, and I would probably eat it! I digress… as I read the recipe I realized I needed 2 loaf pans–umm houston we have a problem!?!?! I only have 1 loaf pan. So plan “B” went into full effect and that meant I was going to adapt this recipe. That’s how the cake was born! I had two round 9-inch pans so cake it was. I also had 7 overly ripe bananas which was 3 more than the original recipe called for–so they all went in because let’s face it if your going to make something banana you might as well go balls to the walls and make it all things banana! lol. Excuse my language if that offended anyone. But, hey, it’s the truth! 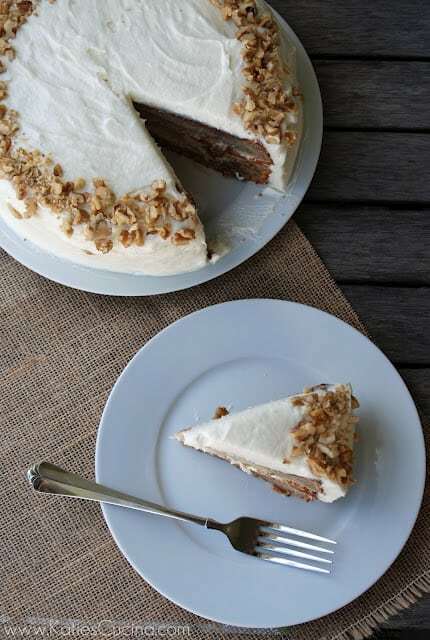 I also received delicious California Walnuts in the mail a few weeks ago and decided to add the walnuts into the cake and as a garnish on top of the cake. All of that doughiness is banana and the tiny bit that looks like cake texture is cake. 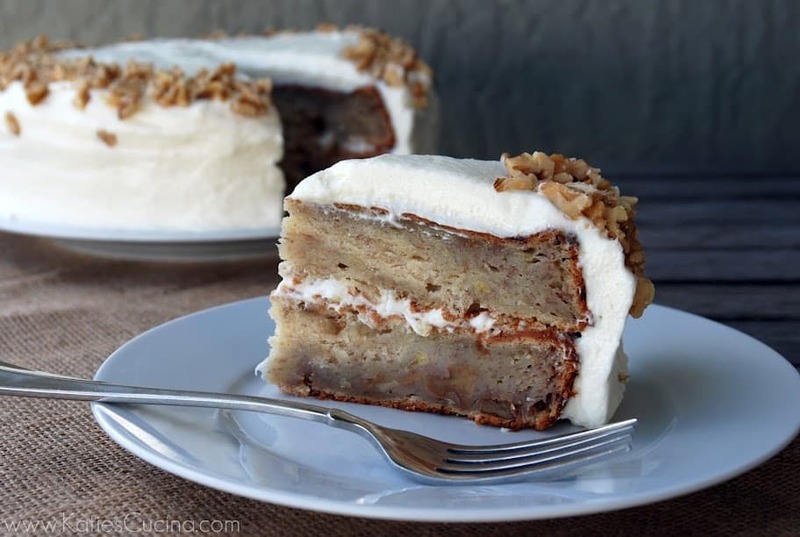 This really should be called banana supreme cake times 10 because its chocked full of bananas! I can honestly say that this is my first cake that hasn’t come out in chunks of pieces. Thanks to my good friend, Julie of The Little Kitchen she told me about this wonderful product made by Wilton. It’s called Cake Release people. And I suggest you run out and buy it now! It’s life changing and will make your cakes look like a pro made them. This cake is perfect for brunch… a mother’s day brunch to be exact. Cake for breakfast… I think so! 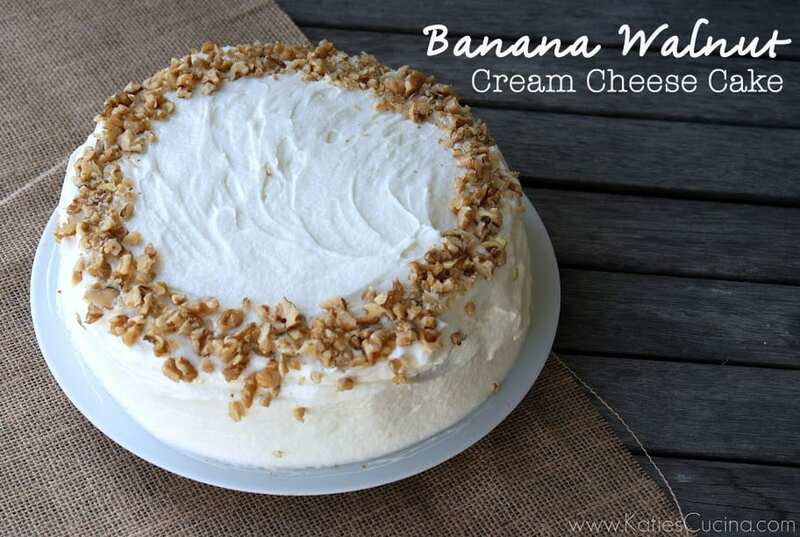 If your menu is already set for mother’s day I’m ok with that–just remember the next time you have a bundle of overly ripe bananas don’t make the traditional banana bread… make a Banana Walnut Cream Cheese Cake instead! Using an electric mixer beat butter and cream cheese at medium speed until creamy. Gradually add sugar, beating until light and fluffy. Add eggs, one at a time, beating just until blended after each addition. Combine flour, baking powder, baking soda, and salt; gradually add to butter mixture, beating at low speed just until blended. Stir in bananas, walnuts, and vanilla. Pour batter into 2 greased (I used Wilton Cake Release) 9-inch circular cake pans. Bake at 350° for 50 minutes or until a long wooden pick inserted in center comes out clean and sides pull away from pan. Cool bread in pans on wire racks 10 minutes. Then, remove from pans, and cool 30 minutes on wire racks before icing. For the frosting: In a stand mixer cream butter and cream cheese together until well mixed. On a slow speed add heavy cream. Mix until fluffy and slowly mix in powdered sugar. Once your ready to ice the cakes; invert one cake on to a plate and ice the top. Then stack the second cake on top, icing around the entire cake. 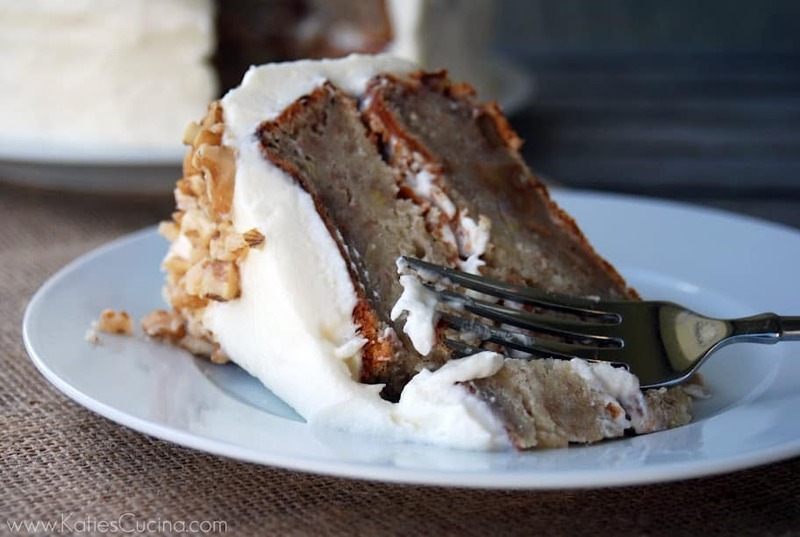 Once the cake is iced take chopped walnuts and garnish on the edge. I used Wilton Cake Release to grease the pans and my cakes came out with out a crumb sticking to the side. This looks fabulous…and yes, I could have it for breakfast! katie, this looks amaaaaaazing. seriously. This looks so good and so moist, Katie!! Cake release is a dream. As is the texture of this cake. Oh my goodness, Katie, it has me drooling. I love it! I know–I’m so happy Julie told me about cake release. I don’t think I’ll ever bake a cake without it again! Awe thanks! It’s super tasty–even more so than traditional banana bread!